Jarrod Berry has likened the final interactions with Clubs leading up to Draft night as something similar to speed dating. “We got a fair bit of exposure with the Clubs in the form of ‘speed dating’, I think they called it,” Berry said. Berry sat down with hosts Michael Whiting and Dom Fay on the Brisbane Lions’ podcast The Roar Deal, to reflect upon his journey that began this time last year. Drafted at pick No. 17, Berry joined the Lions alongside his best mate Hugh McCluggage. McCluggage was selected by the Lions at pick No. 3, while Berry anxiously waited to hear his name called a number of picks later. “When it got to about that [pick] 10, 11, 12 mark the butterflies started to form a bit, I was very nervous,” Berry said. However, Berry’s oldest brother didn’t share those same worries, guessing the exact pick and club that his younger brother would end up with, weeks before the Draft had even begun. “It actually turned out that my oldest brother wrote down in his phone about a month before the Draft, he picked the exact pick that I was going and that I was going to the Lions,” Berry said. Berry said the 48 hours which followed last year’s Draft night were surreal, so excited about his coming journey that he decided to sleep in his new colours. “I can always remember actually getting back to my hotel room and just having the Lions jumper and putting it on.” Berry said. One year on and Berry made an outstanding impression during his debut season, with 16 AFL games under his belt. As the team heads into 2018 and pre-season kicks off again, Berry is currently in a moonboot as a precaution as he deals with a minor foot injury. “It’s not a long-term thing. The Club is just taking very precautionary measurements to make sure it’s right for the season,” Berry said. 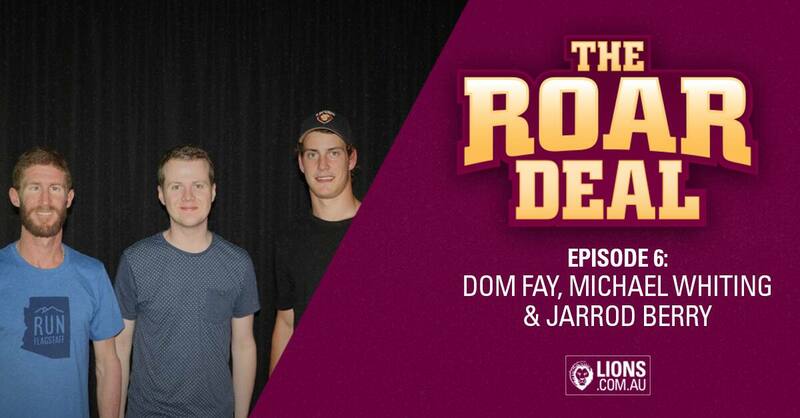 During episode 6 of The Roar Deal, Whiting and Fay also go into more depth with Draft chat, reviewing the Lions’ most likely prospects with only one week to go until the big night.